...I have build the following multifunctional condensation quilt&roof. 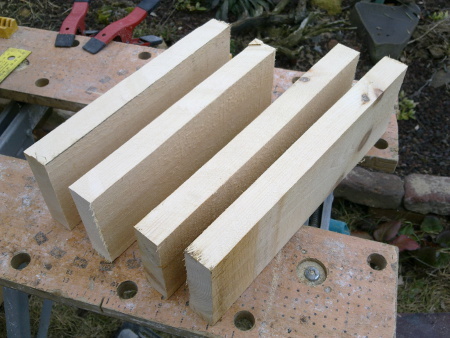 It is build similiar to the original quilt - four boards, two with the outer length same as the hive's outer length, and two with 30 cm length. The height is about 10 cm. Leaving 1 cm (beespace) from the bottom, I mark two lines, 1 cm apart. 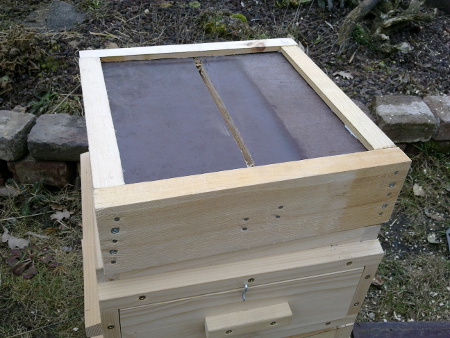 The beespace prevent the bees fixating the roof to the upper topbars. As well as leaving some space for bee and air circulation. 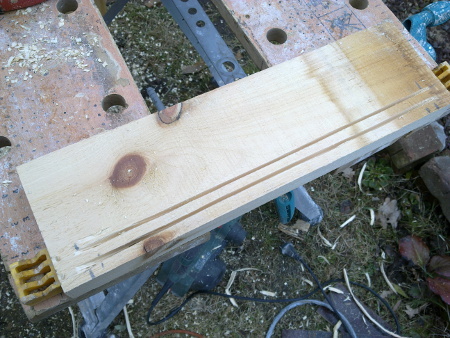 In the space created the bottom board will fit in later. 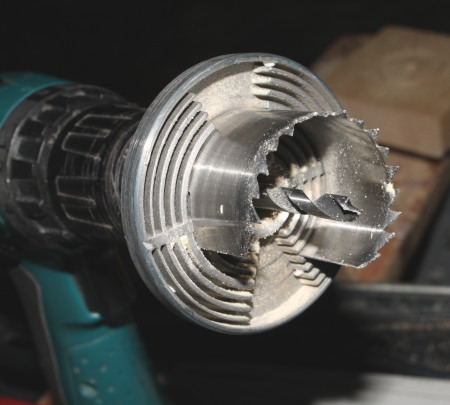 Example cut inserted in the picture. 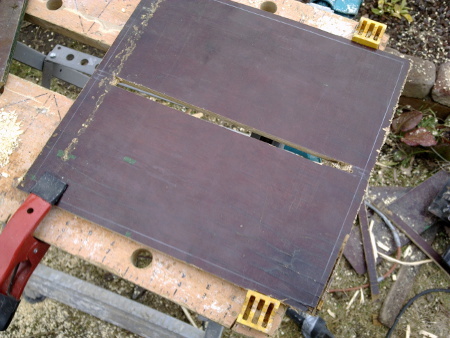 A cutout in the center of the bottom board, the bottom board itself being slightly larger than 30 x 30 cm. 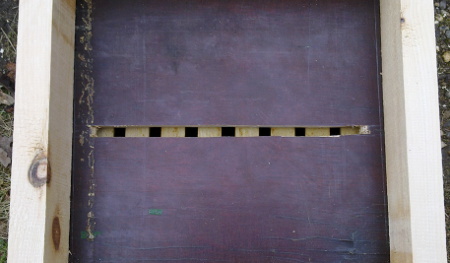 Bees and hive air ascends through that slot. 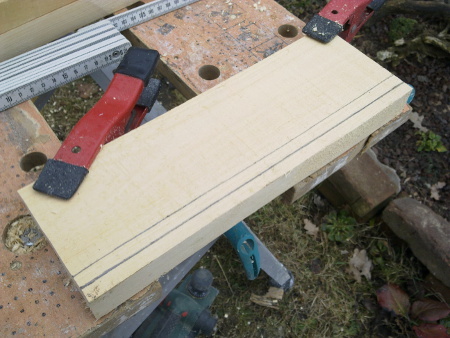 The bottom board gets framed. The slot is extended, so it forms a container on the right+left side. Thus dripping water gets collected in there. Forming a bee well inside the hive. Also it can be used as a feeder. 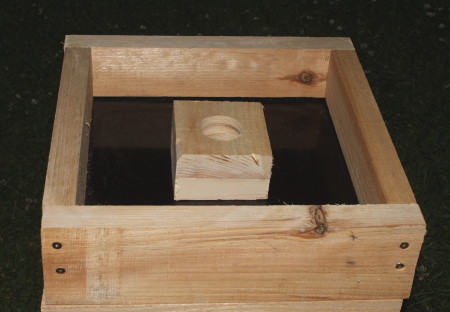 The upper portion is slightly angled, so dripping water goes to the inside. This is the ready build condensation quilt. 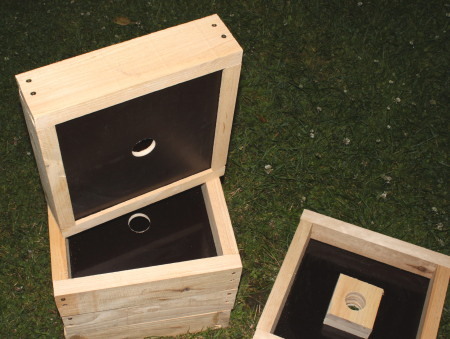 The inside gets painted and sealed with propolis/resin. On top there is a flat metal roof, where the water vapor cools at and condesates. You can use this as a quilt. Of course as a feeder, too. But on top you can use it as a bee escape as well. (For harvesting.) Just place it upside down between brood and honey. Maybe the slot has to be narrowered. I try without any further modification first. I tried to keep the Warré roof principles: Keeping a distance between outer roof shell and hive body, thus rain doesn't drum the bees and sun doesn't melt them. Simplicity of construction. Buffering of hive air and humidity. Cheap to build. 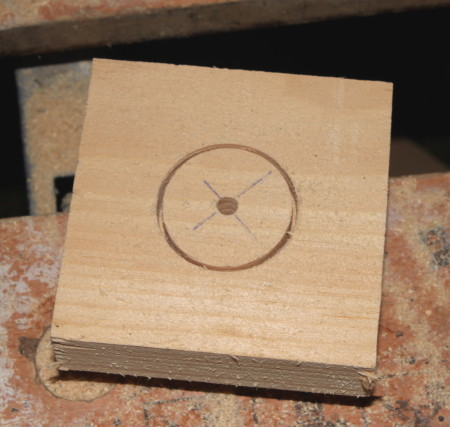 1) Way easier to construct! In 15-20 minutes you build that one. 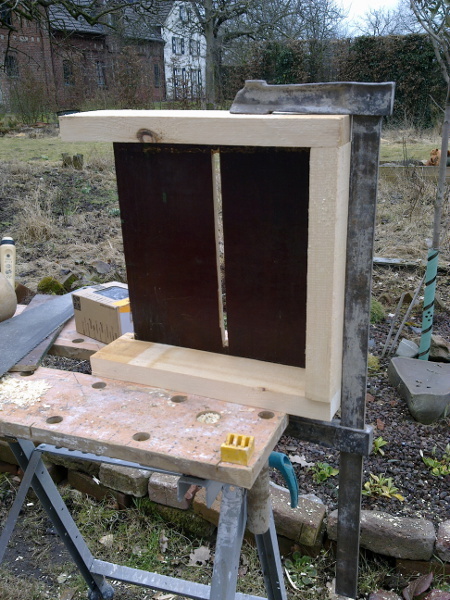 2) Can be stacked, which is important for storage and migration beekeeping. 3) Lighter in weight = better to handle. 4) It (presumbly) buffers moisture much better in a wide range of temperatures. Especially in temperate climates with winter temperatures well below -10°C. 5) You save the feeder and bee escape. Thus less time and money need to be spent. 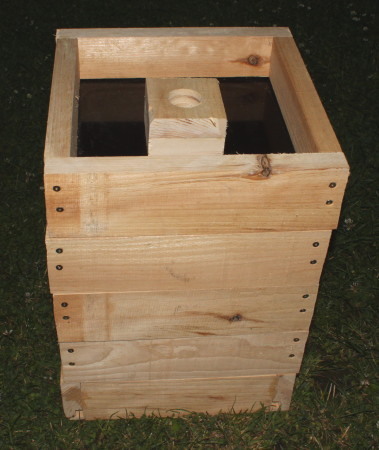 Saves you the storage of feeder and bee escapes. 2) A bit ugly compared to the original roof. In summer the quilt gets covered with a metal roof. The roof might be topped with a cement slab, thus condensation is accelerated right under the metal roof. 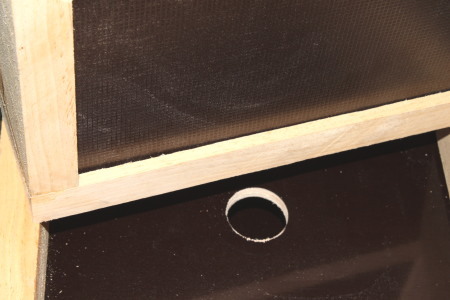 Condensing water from hive air actually means drying the hive air. 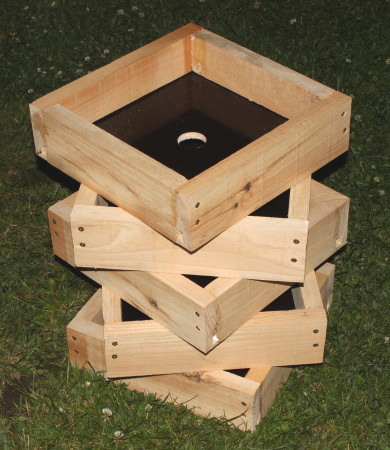 The water can be taken by the bees inside the hive for brood food production or cooling. In winter you top the quilt with some soft fiber insulation, of about 4cm thickness. When temperatures drop below 0°C. Glue an aluminum foil to the underside of the insulation board. Top with metal roof. That should do the job to -30°C. I like it already. We'll see how it works out. I use an alpine hive type roof. Works very well. I love this idea, Bernhard. 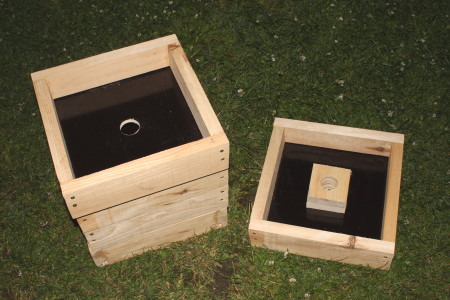 Wondering if the inside of the box would get mouldy though - maybe dipping it in melted beeswax would solve this? Or coating it with shellac? I used molten wax to cover the inside. I use it as a feeder as well and so I need a sealed box. So far it works pretty well. Will have to wait to see it working at wintertime. I especially like the multi-purpose thing. Bee escape, feeder, condensation roof. All in one. While me wife makes some gooseberry jam.. 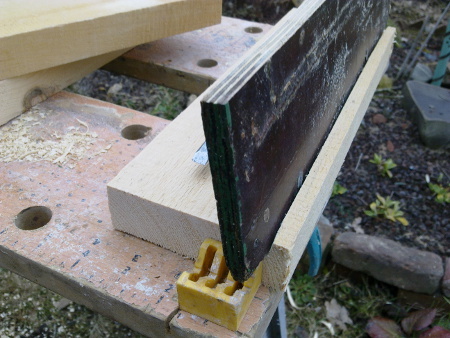 ..I was putting up some more roof boards, inner board or whatever name it should get. It is like the Brother Adam feeder, so Adam feeder it is. 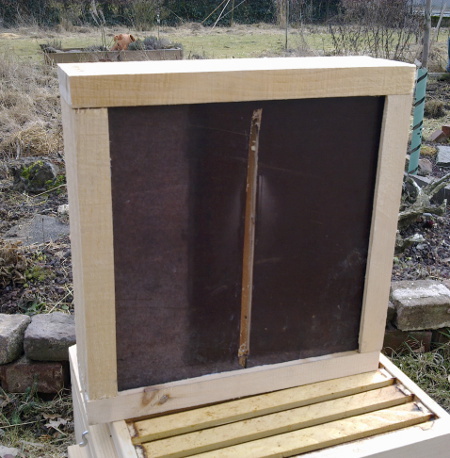 I use it all year round now for condensation purposes, inner cover, as a bee escape and feeder. I kept the beespace under the feeder, because it prevents bee from getting crushed. 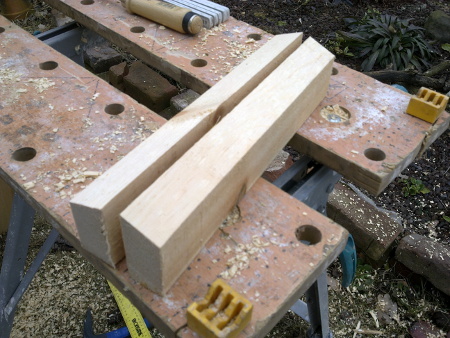 For this I made a cut all around the frame and inserted the board. 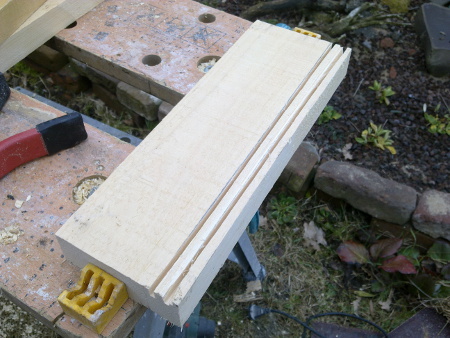 The way up consists of two wooden boards 10x10cm and 3cm thick each. 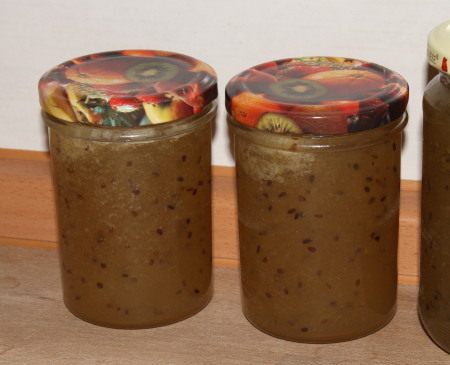 The gooseberry jam looks yummy. May I ask for the diameter of the hole? Thanks. It shows, once again, that there is nothing new in beekeeping and that ideas will pop up again when they are relevant. This is a particularly well-thought-out device and shows that there were people back then thinking about the problem. I wonder, though, if Mt Parson of Guildford had the usual solid floors on his single-walled hives? If so, water would pool on the floor and lead to all kinds of trouble. Temperatures dropped to +10°C last night and this morning I checked a hive and was surprised to find about half a litre of condensation water within the condensation roof! It hasn't been there yesterday and it is no rain, since this particular colony is situated within some sort of shed. It is a strong colony that still has brood (young queen, started late in the season). So the roof actually worked in this case! As I calculated from +10°C on and lower temps. I have to check the other roofs tomorrow morning. Pretty interesting! Wonder how it works at wintertime, when the bees cluster and do not have any more brood. Posted: Sun Dec 23, 2012 3:35 am Post subject: Update? I am a new beek, or can I even be called that yet since I don't actually have bees yet? I have them ordered and will get them in early April. The natural approach to beekeeping seems to fit me. 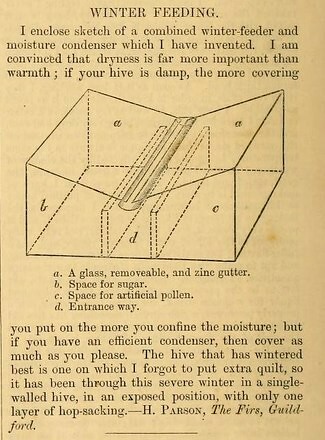 I will be building a Warre hive for my girls and have read info in the forums about condensation in the hive. I am very interested in how the condensation quilt is performing during the winter. Any updates on how your experiment is proceeding? I live in Central Texas and the summers can be pretty hot with day after day over 100F and high humidity. 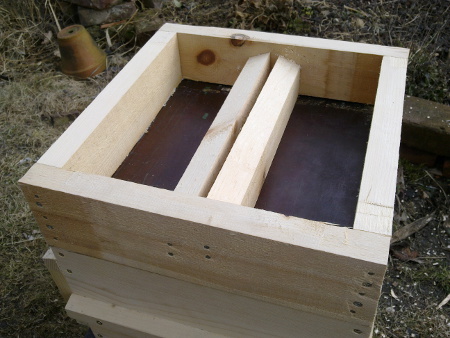 I am building three warre' hives. Which quilt-roof combination would you use? Winters can also be wet and quite cold. 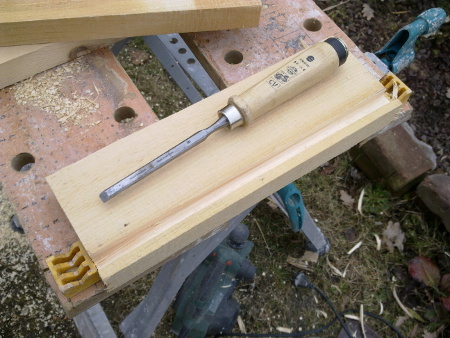 I have three htbh and made the top bars longer and the hives a bit shallower to give the comb more surface area on the bar and less depth and that seems to work but don't want combs melting or water dripping into my in my warre's. The original roof, Warré style, works pretty well under such conditions. Don't know: you may have to take care that no hive beetle makes it into the quilt, though. Maybe you cover the quilt with mosquito mesh from both sides. Thanks. I have had SHB iss issues in my hTBH's. B nematoids help.